Book a skilled lawn pro in Roanoke. Backed by a total satisfaction guarantee and amazing customer support. Roanoke may be the unique dining capital of Texas, but you know it has a lot more to offer than just interesting things to eat! At its heart, Roanoke is a small town that just happens to be in the shadow of a large metropolitan area. Roanoke has its own arts and culture as well as entertainment and is proud of a diverse economy that you can reap the benefits of. At the end of a long day or an even longer week working the last thing you want to do is go outside in the heat and take care of your lawn – and that's exactly why Lawn Love is here. Lawn Love is a fully insured and bonded lawn care company. Our experienced and friendly lawn care technicians want to help you to create and maintain a lawn that you are happy to come home to. We can take care of everything your lawn needs, from simple weeding and mowing to bigger jobs like aeration and fertilizing. Best of all, Lawn Love has awesome customer service, so you won't only love the lawn we help to maintain, but you'll love our technicians too! 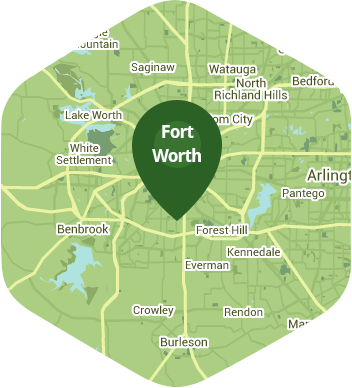 To get started call us today at 817-345-6362 and request a free, fast and easy two-minute quote! Rated 4.72 / 5 stars in 4,119 Roanoke customer reviews. There won't be any rain in Roanoke today, which means you'll probably have to water your lawn. Dusk and dawn are the best times to water your lawn (the sun will rise at 6:49 AM and set at 8:05 PM today in Roanoke). Here are some average lawn care prices for homes in Roanoke. Average lawn size 6,845 sq. ft.